Some 20 net users have come forward claiming they have been wrongly accused of illegally sharing video games. It follows an investigation by Which? Computing magazine into a couple who were accused of playing a game they claim they had never heard of. That case was dropped but other internet users have come forward, claiming to be falsely accused. They face the threat of court action - or fines of up to £665 - for sharing copyrighted games. 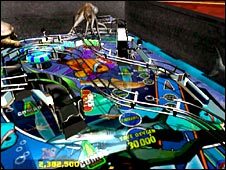 Some 6,000 letters have been sent out by law firm ACS Law, on behalf of firms such as Reality Pump and Topware Interactive, who are the copyright owners of video games Two Worlds and Dream Pinball respectively. The government is keen to crack down on pirates, and the recently published Digital Britain report said that they could be pursued through the courts. "The government is basically calling for a crackdown on illegal file-sharers, which is fair enough, but we've got serious concerns about the process which identifies alleged file-sharers and we believe that innocent people are being accused," said Sarah Kidner, editor of Which? Computing. The IP addresses of alleged file-sharers are initially obtained by anti-piracy firm Logistep which uses software that monitors file-sharing sites. A court order is then sent to the relevant internet service provider, forcing them to reveal the identity of the person behind the IP address. The Internet Service Providers' Association (ISPA) has admitted that the process could be flawed. "We're not convinced of the efficacy of the software and not confident in its ability to identify users," it told Which? Computing. Last year, the magazine highlighted the case of Scottish couple Gill and Ken Murdoch, aged 54 and 66, who were accused of sharing the game Race 07, published by Atari. At the time, Mrs Murdoch told Which: "We do not have, and have never had, any computer game or sharing software. We did not even know what 'peer to peer' was until we received the letter." The case was dropped and the law firm responsible for sending the letter, Davenport Lyons, is being investigated by the Solicitors Regulation Authority.